Feb. 3 — Two conclusions emerge from the Venezuelan conflict almost two weeks after Juan Guaidó’s self-proclamation as president. The first is that the leadership of this attempt to set up a parallel government resides in the United States. The second is that, for the present, the main force does too. Anyone who came to Venezuela to find images of a country transformed into an arena of open battles will have to wait. This Saturday, Feb. 2, confirmed that conclusion at this point in the U.S.-led attack. The coup masters are National Security Adviser John Bolton, Vice President Mike Pence, Secretary of State Mike Pompeo, Special Envoy for Venezuela Elliot Abrams, Secretary of the Treasury Steven Mnuchin, Republican Senator Marco Rubio and President Donald Trump himself. It is a waste of time to follow Juan Guaidó, or any other Venezuelan leader of the right, to find out what might happen. Meanwhile Bolton spoke as the chief: “The United States calls on all military members to follow General Yánez’s lead, and to protect the peaceful protesters supporting democracy.” Bolton was referring to Air Force General Francisco Yánez of the Bolivarian National Armed Force (FANB), who broadcast a video Saturday morning (Feb. 2) announcing his support for Guaidó. Guaidó only specified one particular point of entry: Cúcuta, a border area characterized by the high presence of Colombian paramilitarism, smuggling mafias — linked to or synonymous with paramilitarism — where those who attempted to assassinate Nicolás Maduro in August last year were trained. Cúcuta is one of the main points that could be activated as a key focus, to unleash fires, with the characteristic of getting record media exposure. It was from there, for example, that Luis Almagro, secretary of the Organization of American States, affirmed that the military option against Maduro’s government was not ruled out. It is likely that if the coup plotters follow this scenario, the conflict’s center will alternate between Caracas and those critical points. How do they plan to bring in aid? With what logistics, force, permission and actors? What type of action will accompany the entry? The “parallel government” needs territory and the capacity to exercise power — two factors it does not possess now. The only thing that makes Guaidó “president” at the Venezuelan domestic level is that his right-wing social base calls him that. It is evident that neither he nor all the right-wing together have the strength to carry out this kind of strategy. The Bolivarian government will not let U.S. forces or hired contractors open a wedge into Venezuela’s national territory. No government would allow a foreign force — or its agents — to enter without its permission. The game is now at stalemate. Washington argues for no dialogue and rejects attempts such as those the governments of Mexico and Uruguay proposed, or positions such as that of the Secretary General of the United Nations, which affirm the need for dialogue. Some countries of the European Union proposed the creation of an International Contact Group with Venezuela — made up of 10 or 12 members, not all of them European — to advance the proposal to reconvene elections, with a period of 90 days to evaluate the results. 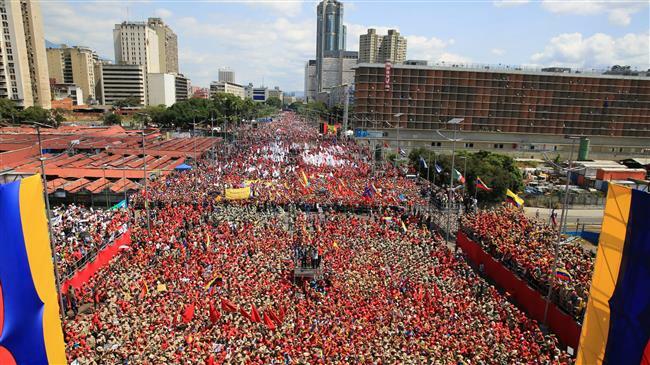 In this context, Maduro announced at the mobilization held on Feb. 2, where Chavismo carried out a new show of force, that it will consult on the possibility of anticipating the legislative elections that are due to be held in 2020. It would be a way of trying to deactivate the National Assembly, with all the risks that entails. Would it be preferable to let the National Assembly move forward in its attempt to set up a parallel government, beyond all legality, with the aim of carrying out a coup d’état? It seems clear at this point that the U.S. will move forward and use any argument to redouble its narrative that there will be no negotiation. Many U.S. messages are aimed at breaking the will of Chavismo and in particular of the Bolivarian Armed Forces, which is their main goal. To achieve the latter, they have worked out a series of steps, from promising amnesty for the generals to threatening direct U.S. military intervention, and including accounts created in social networks to convince soldiers to disobey the generals [if they order repression of the pro-coup forces — WW]. So ends another week in Venezuela. The struggle is nonstop. The speeches by the U.S. leaders of the coup attempt say they have set a final offensive in motion. Chavismo remains unbroken and mobilized, with the will both to talk and to fight. Teruggi is an Argentine journalist and political analyst who has been living in Caracas. 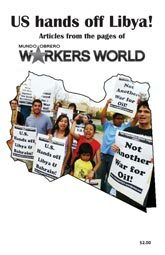 Translation by Workers World Managing Editor John Catalinotto.